Vintage Clothing Blog | Vintage Wedding Dresses | Salvage Life: You Asked: Where Do I Find My Vintage? You Asked: Where Do I Find My Vintage? This is the question I get asked more than any other. I can almost never tell someone what I do for a living without it being quickly followed up with, "So, where do you find all your stuff?" This used to really bother me, how dare someone try to steal all my secrets, I would think. But as time has gone on, I have begun to realize that most people are genuinely curious. They like what I sell and they aren't that familiar with vintage, so they wonder where it comes from. Also, it has taken me time to see this, but what people are paying for is my time and my eye, not my secret vintage sources. It takes time to sort through shops, estate sales and flea markets. Most people are fatigued easily by this process, but not me, I'm energized. Then there is the time to clean, repair, photograph and ship it to your door. Secondly, my ability to sort through the crap, and let me tell you, there is a lot of crap in this world. For every great dress I find, there are thousands that are tacky, have moth holes, stains, odd sleeves or are size xxxsmall. I know which stains will come out and I will clean it 5 times if I have to. I keep up on what is in style and what you are buying, so I only buy what you want. All of this is to say, where I buy my stock isn't a secret, you are paying me to shop for you. Even I don't pay wholesale prices for a lot of the vintage I buy for myself and my home, given the mostly one of a kind nature of vintage, if you really like something, you better buy it when you see it. So, here is a list of where I shop for Salvage Life. These are general, not specific, you have to do a little work on your own, try Yelp it 's great for finding shops and markets. 1. Thrift stores...you don't find a ton of old vintage here. 1970's and newer and lots of great housewares. I shop a lot at thrift shops for me and my family, so if I come across vintage, I pick it up. 2. Flea Markets...I probably buy the most here. You have to get up early and endure the weather. The last flea market I went to was in the rain, but it was worth it because there weren't a lot of shoppers. There are tons in Southern California, usually on Sundays. I'm partial to the Long Beach Antique Flea Market, since it is so close to home. 3. Antique Shops and Vintage Clothing Stores...I don't usually go to these places looking for store stock because the prices are higher than wholesale, but I shop there for fun and sometimes I run across things that are affordable enough to sell. Or if I am looking for a specific item for a client. 4. Estate Sales...digging through dead people's stuff was awkward at first, but it really is a treasure hunt. It is amazing what people hold onto, it makes me think about my own hoarding problem. I think these are where you can find the best stuff, but they are hit and miss and there is a lot of competition. I have driven a hour, waited in line for two hours, only to find out that "loads of vintage clothing" meant a few pairs of polyester pants. Also, there are dealers who get into the sales early sometimes and get all the good stuff. I went to a lot more of these before I had Ruby, it can be hard to take a two year old. 5. Referrals...Sometimes I get a call or an email from a person who heard about my shop and has vintage to sell. This can be great, but beware, what other people think is vintage, may not be what you are hoping for. Here is where the time comes in again, I drive to someone's house who says they have tons of vintage and they have a couple hats and a few pieces of jewelry, but if I didn't go I would be dreaming of this amazing score that I passed up. I have learned to ask specific questions and request photos before driving to the location. 6. Warehouses...there are some companies here that sell vintage by the pound. I have had some success with these and the prices are really good, but you have to dig through a lot of dirty, smelly clothes to get to the good stuff. I put on gloves and a mask and go to town. I did a lot more of this too, before I had Ruby. Since I am so particular about my stock, I have a hard time buying in bulk. So, there you have it, the veil has been lifted. 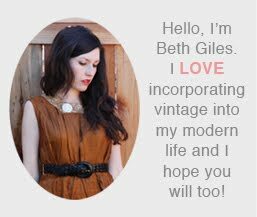 Okay Beth- I love reading your blog and seeing what you are up to in the world of vintage. I have to give you an advertising idea that might help quite a bit. I follow this blog religiously (I am quite addicted). www.kellehampton.com. When you go to the blog, you absolutely must read Nella's birth story first. Anyway- Kelle has thousands and thousands of followers, and she has sponsors of small buisinesses that get quite a bit of traffic through her blog. Check it out- I think you will like it!